RiskITWeek book, an easy to read and concise. It is designed to help you plan and implement the strategy in your school. Ben masterfully leads the readers in a joyful, charismatic and enjoyable trip into the world of ICT through a philosophy worth Risk Taking, a very detailed book with plenty of examples on how to use Modern Technology linked into a classroom setting with the aim of recreating a positive impact on students learning. A confident an holistic teacher not only embraces more than one approach in teaching but also combine and encourages the use of modern technological equipment as valuable tools in order to deliver interesting and motivated lessons, lessons where students are the centre of the process and very much willing TO DO. This book designed with teachers in mind will inspire you to try out fresh ideas in the field of ICT. RiskITWeek is a philosophy, a calculated risk and a tool that virtually guarantees a ‘win’ for schools, their pupils and teachers! Is it easy? – It just requires commitment to effective CPD from school leaders. 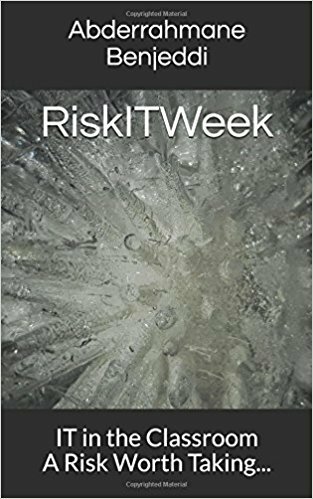 This book “RiskITWeek – IT in the Classroom A Risk Worth Taking” provides the necessary knowledge, advice and strategy to make a success of risk-taking, discovery and innovation without fear. Abderrahmane (Ben) Benjeddi offers this book as a guide to the strategy. It is written with a joyfully light touch and can be read cover to cover or by dipping in and out of the sections of most interest. Seasoned with helpful, robust, education research, the book is full sage advice born out of experience and real-school practical suggestions. Not to be missed are Chapters 5 and 6 about implementing and embedding ICT in the classroom – these chapters are full of really good examples of ICT across all kinds of curriculum areas! When I first became aware of RiskITWeek, the idea immediately got my attention - I knew so many teachers who were apprehensive of using technology in their subject - frightened that they would look foolish in front of pupils who had grown up with computers or frankly, scared the tools would stop working. Even now that there is so much focus on the new UK Computing curriculum, many teachers receive training on coding but not in the wider aspects and skills of using education technology. RiskItWeek is a pragmatic idea based on simply providing professional and technical support to teachers without negative criticism. What makes this 'doable' and transferable to any school is the strategy - where teachers take a risk and use new technology or innovate with technology in a culture of support where people learn from each other and celebrate the process made visible. I wish RiskITWeek had been invented when I was ICT Coordinator! Don’t wait – this little book is a life-changing opportunity for the whole school community. A joyful little book that reminds us why we want to teach and how we can continue to create excitement in the classroom. Full of optimism for the impact of well managed technological change on learning. Inspires by detailing supported risks taken in collaboration between students and staff and between staff teams to bring about long lasting improvement. World Book Day approaches and I am a born again writer as well. How do you judge a book? By HOW it changes YOU and as an education person how it changes your practice. Phantom Tollbooth 1 Eats, Shoots & Leaves 0 the parody is more creative!. So after RiskITWeek I have now delved into Sphero, Invent, Zu3D and A Tale Unfolds.Ben ...Benjeddi is brilliant and has a message for every ICT educator in the land and globally. BUY IT. READ IT. GIVE IT TO SOMEBODY WHO CARES AND CAN DO. YOU CAN AND IT WILL MAKE EVERYBODY BETTER THINKERS AND DOERS. RiskITWeek: Edtech’s answer to ‘Make do and mend’. How much edtech kit is gathering dust in schools? How can you ensure an approach to achieving effective return on investment in edtech in your school? Looking for answers? Then this a great little book to read. Lots of practical ideas and simple easy to implement strategies from a teacher/leader who is passionate about his RiskIT strategy.